A large number of inks within Fujifilm’s Uvijet UV range for use with wide format print applications has received the Nordic Ecolabel certification, further endorsing the company’s green credentials and its position as a world leader in the development of UV inkjet inks, which is underpinned by the ‘Sustainable Innovation’, ‘Manufacturing Champions’ and ‘Best Process Plant’ awards it has won in the last four years. The Nordic Ecolabel is a well-established and internationally recognised environmental labelling scheme that contributes to sustainable consumption and helps consumers identify environmentally friendly products. The certification confirms Fujifilm’s commitment to manufacture products that meet the highest quality and performance standards, according to the company’s internal ‘Design for Health, Safety and Environment’ policy regarding the use of chemicals. This policy is designed to limit employees’ exposure to hazardous substances, minimise environmental impact, and to surpass the requirements of chemical control legislation. Fujifilm Uvijet inks that now carry the Nordic Ecolabel trademark include theUvijet KI, KV, OZ, OB, OL, OW, QN, WH, WI and LL. 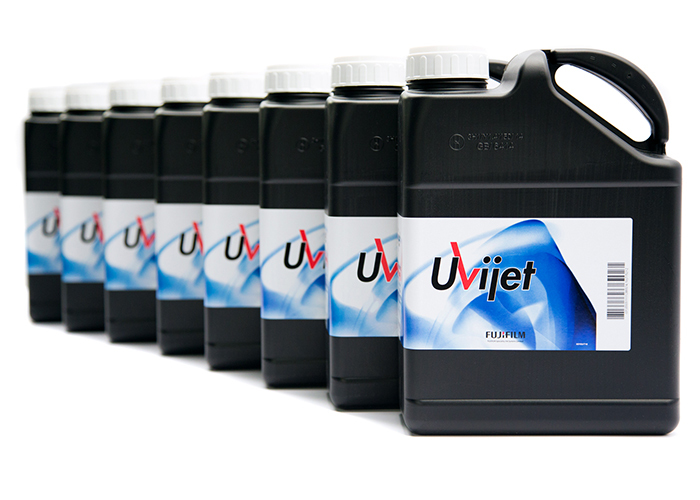 Uvijet OB, OZ, OL and OW formulations, which have been developed for use with the Inca Onset range of printers. Uvijet OZ offers excellent finishing properties, while Uvijet OL is a lowodourcorrugated ink suitable for display and secondary packaging. The newly launched Uvijet OW ink offers improved adhesion properties, so that it can be used on a wider range of rigid and flexible plastic substrates. The Uvijet KI and KV inks are suitable for Fujifilm’s Acuity flatbed range, the latter designed for thermoformed light industrial applications, with Uvijet WH and WI inks optimised for the Acuity F in particular. In terms of roll-to-roll systems, Uvijet QN inks are supplied for Uvistar printers, with the Uvijet LL range of inkjet inks specifically developed for use with the Acuity LED 1600. In common with all these inks is the ability to deliver excellent dot reproduction, produce bright, vibrant colours and adhere to a wide range of rigid and flexible materials, maximising application versatility. Fujifilm Uvijet inks are produced at the Fujifilm Speciality Ink Systems (FSIS) manufacturing facility for screen and UV wide format ink in Broadstairs, UK.